Aquafeed is defined as food specifically prepared for aquatic animals in order to fulfil their nutritional requirements. Aquafeed is generally prepared with specific ingredients and additives that are nutritive in nature, and are supplemented in very small amounts. Aquafeed is now available in vast product ranges, owing to increased consumer attraction towards its functionality and species-specific requirements. Aquafeed is derived from plant sources only, such as corn gluten meal, canola oil, soy meal, and sunflower protein concentrate. Among them, the most commonly used ingredient in aquafeed is marine sources such as fish meal and fish oil. The most marketed and preferred form of aquafeed among the entire global aquafeed products, nowadays, is the extruded type of aquafeed, due to its high disintegration rate and faster onset of action in fish. Aquaculture production is anticipated to play a crucial role in the aquafeed sector in the coming decade, as most countries are stepping up their production activities and revising the regulations to ease down the aquaculture ecosystem into more friendly international trade zones. At a country level, governments are projecting optimistic forecast overproduction at very realistic levels, which is a great driver for players to invest more into the aquafeed market. Key authorities are indicating strong reforms to be pushed in for aquafeed products in the European market, for which players in key producing countries such as China, Peru, and Norway, among others, have to increase their standard of production for aquafeed to safeguard themselves from the restraints caused by these regulations. Among the species type segments, the fish segment is expected to register a significant growth rate of around 5.5%, owing to the increasing utilization of fish trimmings in the aquafeed market. Nowadays, marine fish farming industries are shifting towards the use of co-products such as fish trimmings as aquafeed in order to leverage the resources that otherwise go waste. For instance, recently, Cargill Inc. started using fish trimmings as co-products from fisheries in aquafeed in order to reduce the dependency on forage fish. Data provided by the World Bank indicates that, marine and terrestrial protected areas covered by the UN Environmental Program & the World Conservation Monitoring Centre provide ample opportunities to aquaculture companies to cater to the increasing demand efficiently, which is also anticipated to bolster the growth of aquafeed over the forecast period. The data states that, in the year 2000, the percentage of marine and terrestrial land was around 8.79%, which went up to 12.8% by the end of 2014, showing an opportunistic growth over the years. In order to minimize the environmental and ecosystem impact caused by aquafeed, several companies are drifting their research towards innovative aquafeed formulations to increase its nutrient digestibility. According to FAO, high digestibility of aquafeed ingredients indicates lesser loss is the nutrient and aquafeed wastage, supporting elimination of negative environmental and ecosystem impacts. Aquafeed is easily available through wider market penetration with various retail formats. The ease of access across the world drives consumers towards having aquafeed. The liking for aquafeed is predominantly compelled by mounting demand for accessible packaging. In fact, this is a key factor that can be associated with the growth of the aquafeed packed in small sachets, in both, Japan and Eastern Europe. Consumers, nowadays, have shown increasing fondness for handy, convenient, and efficient packaging, and sachets are supposed to fulfill all these three requirements. This aspect is estimated to drive growth of the aquafeed market over the years. The aquafeed industry will be affected by expected growth within premium lines of aquafeed, appealing to consumers looking for a better product containing high nutrition content required for aquaculture production. Various manufacturers of premium aquafeed products use different captivating advertisements to evoke a sense of authenticity to buy the product. The sales of premium products is currently mainstream in Japan, and is increasingly been differentiated from private label. Premium 'selected' versions target consumers who are willing to pay more for high-quality ingredients and better aquafeed products. Consumer preference for aquafeed products is expected to observe a significant upsurge over the next couple of years. Manufacturers and suppliers of aquafeed products are optimizing product offerings according to consumer demand. Owing to high profits margins, various manufacturers are increasingly entering the aquafeed market in Europe. Many companies are expected to launch aquafeed products with high nutrient value in the next three to four years. Additionally, manufacturers are also expected to market their aquafeed products with natural labels, to attract existing, and increase the number of new customers. 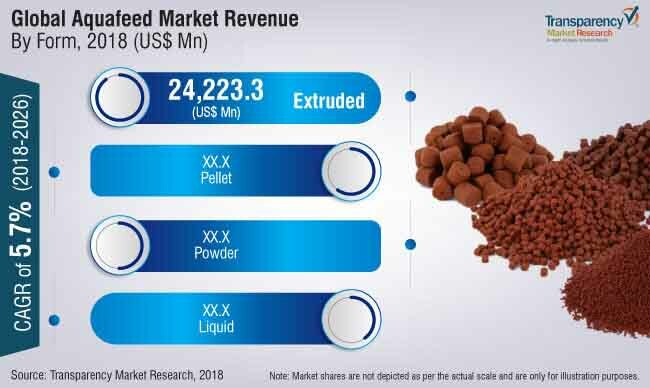 The entry of new players is anticipated to significantly drive the growth of the aquafeed market over the forecast period.